have been subject to some early finishes and late arrivals. I missed most of Round 40, however in the brief period I was there, views were being aired whether themes were being well observed. Despite not being there long enough to play it, for once I had actually been compliant myself. Seeking more “discipline” amongst the members, an awkward theme for round 41 was born. I consciously avoided and found myself irritated by Depeche Mode for the first 10 years of their career. But when Violator came out in 1991, I was intrigued by the singles and the positive reviews. This was my original thought for the round (as the title does sound like something you might select from a specialist magazine for those interested in the darker side of discipline). However, I plumped for their next album instead. Clearly (ahem…), the observance of discipline takes a good deal of faith and devotion. Looking back it seemed to slip a lot of people’s attention that the “Mode” had already broken America with this album going to no1 in US, a year or two before the “brit pop” pretenders tried the same. A lot of better informed people than me put this albums sound down to the emergence of grunge, but I don’t really see it myself. There are some “gutty guitar” moments (for reference see http://www.youtube.com/watch?v=BgAKNy23RSA) and a few bits of distortion, but for me it’s more about dark, pounding beats. It’s a brave move on some of the tracks for Dave Gahan to take his vocals to such prominence. But even on the gospel orientated ‘Condemnation’, he just about gets away with it. It takes a moment to remind yourself you are still listening to the same band that were on “Swap Shop” in 1981 with (http://www.youtube.com/watch?v=JyG4NtpdO-Q). ‘In your room’ has always been the stand out track for me, with a feeling that it just sums up the claustrophobic sound they were trying to achieve. To lighten proceedings, the gospel theme returns on ‘Get right with me’ and just before the end the there is the softer ‘One Caress’, with nothing but vocals and strings. Electro/techno or whatever doesn’t feature highly in my listening, but these two albums have always filled a niche. I’ve never felt the need to go looking for the 4 albums that followed, always concerned that they wouldn’t stand up against this one. 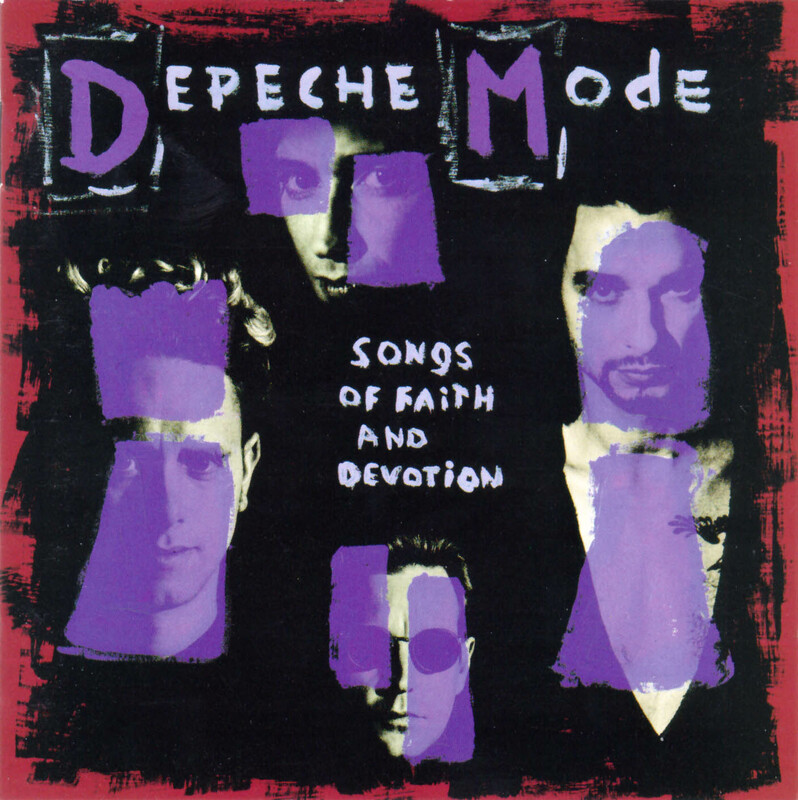 Rob listened: I’ve never felt a great deal for Depeche Mode. Their fans always seemed a little too earnest, their music a little too pedestrian, never really transcending. Even within these extremely narrow boundaries, i’m at the opposite end of the Depeche spectrum from Graham. Their singles compilations are divided between 81-85 and 86-98 and, looking down the track listings, there’s nothing on the second album I feel like I have time to hear again, whereas there is something a little delicious about the moment the drum machine kicks into ‘New Life’ and ‘Just Can’t Get Enough’ is good enough for any 80s revival night. As for ‘Songs of Faith and Devotion’, well, I came in half way through and didn’t really manage to get a grip of it. I picked up the darkness, but it sounded like a band trying to be dark. I know Dave Gahan has been through difficult times and perhaps the rest of the band have too, but I didn’t get anything from this listen that really captured how that might have been. I guess i’m just not a believer. Tom Listened: I would echo pretty much everything that Rob has written only to add that I quite liked it! But, as he has hinted, I couldn’t lose the feeling that there was something intangibly soulless about this record. No idea what it was that caused me to feel this way but, if I’m honest, this is how I’ve always felt about Depeche Mode and this feeling is probably too ingrained to be overturned, even through the strange and magical alchemy that is DRC. So, whilst I found it enjoyable to listen to, it didn’t leave a lasting impression on me – I guess me and the Mode will continue to be occasional acquaintances rather than soul mates! Nick listened: I’m broadly with Rob here, even though I own Violator, and like it well enough – there’s just something a little too try-hard synth-goth about early 90s Depeche Mode. I didn’t mind it, but I pretty much never play Violator, and felt no need to get to know this any better.